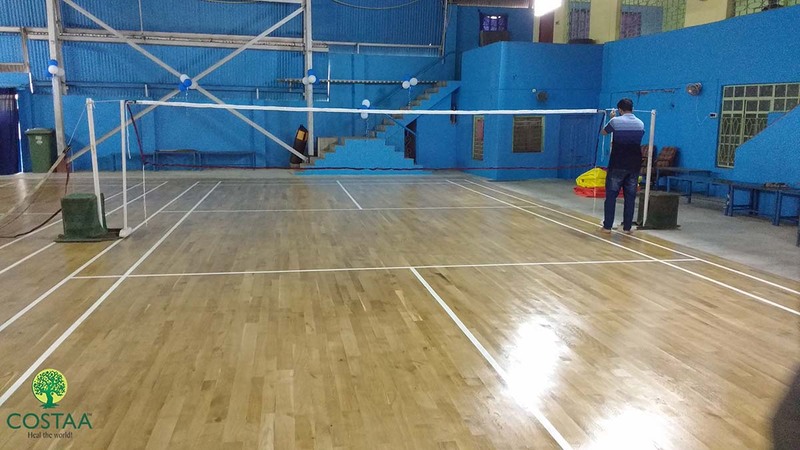 Wooden Flooring of Badminton Court – Costa Sports Systems Pvt. Ltd.
Court Width : 6.1 meters (20 ft) and in singles this width is reduced to 5.18 meters (17 ft). Short Service line : at a distance of 1.98 meters (6.5 ft) from the net. Long Service line : at a distance of 0.78 meters (2 ft 6 inches) from the back boundary. The Net : 1.55 meters (5 ft 1 inch) high at the edges and 1.524 meters (5 ft) high in the centre. The net posts are placed over the doubles side lines, even when singles is played. For all the badminton enthusiasts in the city there is something here at our store that will not fail to surprise you. We believe that you can reach at the zenith of success with all your talent. 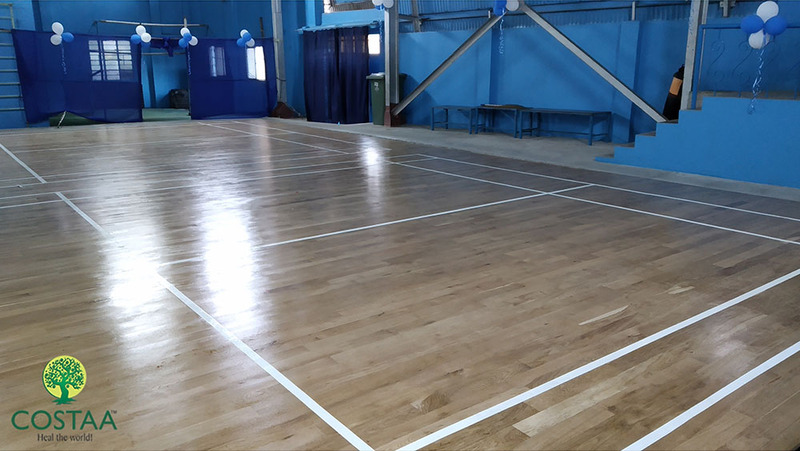 All we can do is to support your practice arena with the flooring that you demand for a perfect game of badminton. No more of those plain looking floors, that does not give the right ground for a professional player. From Costaa Group of companies you will receive the flooring that you have dream for your practice. 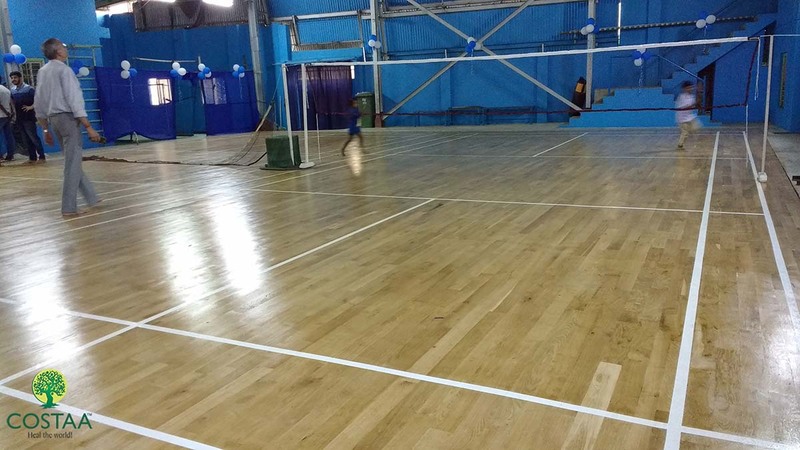 The perfect finish of wooden flooring of badminton court is what we strive to offer you. The maple and the white oak wood that we offer are resistant to moisture damage. We guarantee that the wood will neither stain nor fade from its initial look. We will create a perfect work space that is professional. We deal with different disciplines of wood business. There are different ranges of wood and each has its own specialty. The professionals of our company works in accordance with the client’s preference to deliver what will suit every preference of the client. We also deal with designer range flooring with premium quality synthetic sheets. The durability and scratch resistant is the promise of quality products and we offer you such quality products at reasonable price. Easy installation of the wooden flooring will be done by professionals who will also guide you with the right procedures of maintenance. It is always to be kept in mind that proper maintenance is the key to durability of any product. Get the wooden flooring done soon without any hassle from Costaa Group.